Rising price of diesel and poor connectivity of grid electricity across several prime countries in African have led to the growth in demand for solar water pumps in Africa. Further, Zero carbon emissions by solar pumps is also a prime factor responsible for the growth of solar water pump market. Additionally, owing to its high dependency on agricultural activities, African countries witnessed high demand for solar water pumps in agriculture application for irrigation purpose. Africa solar water pump market report thoroughly covers the solar water pump system market by power ratings, design, applications and countries. 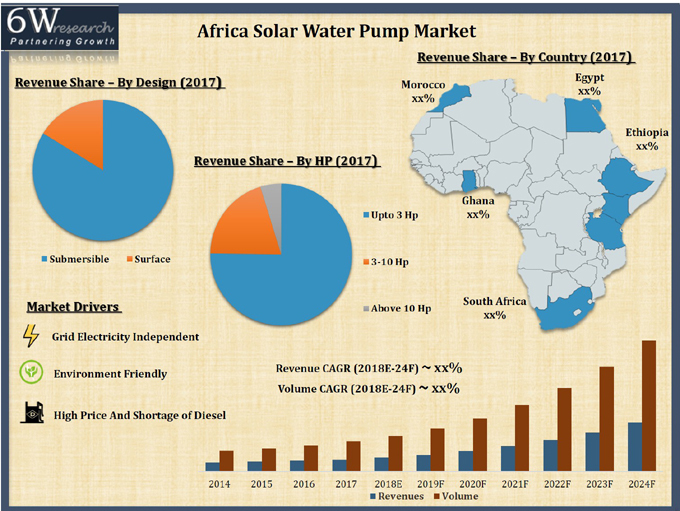 The Africa solar water pump market outlook report provides an unbiased and detailed analysis of the Africa solar water pump market trends, opportunities/high growth areas and market drivers which would help the stakeholders to device and align their market strategies according to the current and future market dynamics.